We are pleased to introduce a range of handmade Belgian Princess lace veils. These veils are handmade in Belgium and can be ordered in white or ivory. For a small additional cost they can be dyed to match the colour of your wedding dress. The veil is an oval veil design which can be worn as a mantilla veil flat on the head or we can add a comb to create two layers of which one layer can be worn over your face. We can use the veil to create the Kate Moss Wedding veil and attach the veil to the ribbon Juliet cap headpiece. They are luxurious in nature and feature beautiful ornate flower patterns woven onto a 100% cotton base. There are only 70 lace-workers left practicing this very traditional ace making technique so production is limited to 300 veils annually. These veils are truly one of a kind as they are made individually by hand and can become a family heirloom passed on to future generations. 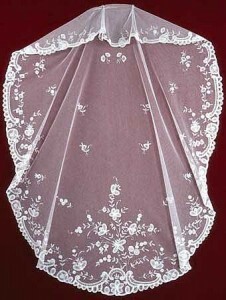 If you are considering purchasing a Belgian Lace veil you will need to order ahead. We would advise an order time of 12 weeks. It was a layer of Belgian lace that Kate Moss chose for her wedding veil.